We recently completely remodeled the bathroom, added a new split system a/c in the bedroom and living room, brought in a new sofa bed with a more comfortable memory foam mattress, and replaced the cushions on the Lanai sectional and reading chair. 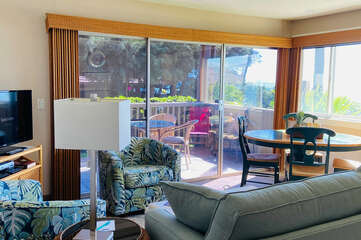 You can enjoy a small ocean view from the Lanai with your morning coffee, or walk a few steps down to our lovely walking and swimming beach. No need to cross the street. The kitchen was also recently updated and has everything you will need if you want to eat in. Right outside our condo is a refreshing pool for your enjoyment. There are two barbecues and tables by the lawn area at beach front where you can have cocktails, cook dinner, and watch the incredible Maui sunsets, and just might see whales breaching during whale season. We are centrally located with easy access to anywhere on the island. Come and enjoy Paradise at Kihei Kai #19 on Sugar Beach!